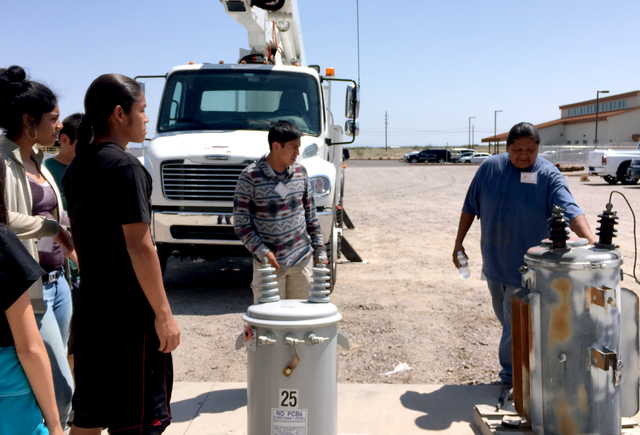 Native American students from previous Tour exploring tribal utility development at Gila River Indian Community Utility Authority in Chandler, Arizona. (PRLEAP.COM) On August 7th, students representing Northwest Tribes will kick off the annual Inter-Tribal Energy & Tech Tour at the Pelton Round Butte Hydro Project. The project has generated clean, renewable, emissions-free electricity to nearly 150,000 Oregon homes for over 10 years and is co-owned and co-managed by the Confederated Tribes of the Warm Springs Reservation of Oregon, and Portland General Electric (PGE). The Inter-Tribal Energy & Tech Tour is produced each year by Redbridge Foundation, a non-profit 501c3 company based in Portland Oregon. Participating students are selected by application process. The Tour's mission is to raise awareness among Native American youth for opportunities in STEM-related careers and utilizes social media marketing to share student experiences with their communities via Twitter and Facebook. The National Science Foundation Science & Engineering Indicators 2016 Report states that "The proportion of U.S. S&E master's degrees earned by underrepresented racial and ethnic minorities increased from 14% to 19% between 2000 and 2013. American Indians and Alaska Natives accounted for 0.5%." For generations, tribes have practiced sustainability and environmental preservation. The U.S. Department of Energy's Office of Indian Energy Overview estimates that 14 billion MWh of utility-scale solar, 1.1 billion MWh of wind potential, and 7 million MWh of hydropower resources exist on tribal land. "With over 500 tribes across the US and 5% of the nation's natural resources on tribal reservations, energy and technology savvy tribal communities are in a position to generate power and jobs for their communities and lead market transformation. And it starts with educating tribal youth about the potential. Get them inspired and asking questions and there's no limit to what they'll achieve," said Shannon Hulbert, Yurok Tribal Member and President of Redbridge Foundation. According to the U.S. Census, 39% of the total American Indian population living on reservations are at or below the national poverty line. Seven of the 10 poorest counties in the US are located in tribal communities, where unemployment rates can reach as high as 35% and broadband penetration can be as low as 10%. A 15-year old student on the 2017 Tour says, "A lot of tribes are poor. A lot of people in Indian country still don't have good heating or energy. Learning about renewable energy and technology could benefit them and save everybody money." The 2017 tour is funded with support from Portland General Electric (PGE), Redbridge, Inc., and Portland-based cloud and colocation company, Opus Interactive. Redbridge Foundation, a 501c3 in Oregon, is a non-profit organization that annually hosts the Inter-Tribal Energy & Tech Tour. Founded by a member of the Yurok Tribe of California, the Inter-Tribal Energy & Tech Tour is the nation's first summer camp dedicated to raising STEM awareness among Native American youth. Since its launch in 2013, the Tour has been received participation from over 30 tribes, and introduced students to over 20 native-owned projects throughout the country, including solar and wind energy, and data centers. About Portland General Electric Company: Portland General Electric (NYSE: POR) is a fully integrated energy company based in Portland, Oregon, serving approximately 865,000 customers in 51 cities. For more than 125 years, PGE has been delivering safe, reliable energy to Oregonians. With 2,700 employees across the state, PGE is committed to building a cleaner, more efficient energy future. Together with its customers, PGE has the number one voluntary renewable energy program in the U.S. For more information visit PortlandGeneral.com. The Confederated Tribes of Warm Springs, Oregon, is based in Central Oregon with a membership of over 5,000 Tribal Members from the Warm Springs, Wasco, and Paiute tribes.